When you first visit Belgravia one of our friendly and helpful receptionists will ask you to complete a few personal details about yourself and your health on the consultation form. You will then meet an experienced hair loss specialist, who will ask some questions and make some notes before carrying out a thorough examination of your hair and scalp. 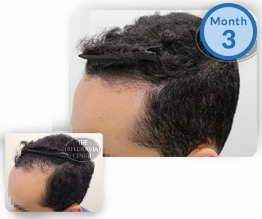 The tricho-check is free of charge and takes between 30 and 45 minutes. The Tricho-Check is very thorough and ensures that any problem is diagnosed correctly. Your hair specialist will ensure you fully understand any problem, its probable cause and how it is best treated. Any recommendations are then discussed by your personal specialist with a dedicated treatment advisor. He or she will then go through the hair loss specialist’s report in detail with you, and – if treatment is recommended – you will be advised of what the treatment is, how it works, and how to use it. You will of course also be advised of the cost and the most economical way of paying for your hair loss treatment course. A course of treatment for clinic or for home use is always recommended so that you can make the best use of the complementary products that are available from The Belgravia Pharmacy. Paying for treatments individually is not the most economical way to pay, but you can pay this way if you prefer. Whilst Belgravia’s in-clinic pharmacies provide clinically-proven and medically approved prescription treatments, our hair loss specialists will often recommend additional clinical therapies such as low-power laser light therapy (LLLT), infra-red therapy and scalp massage. These additional therapies are known to boost the stimulation of the blood supply that feeds hair follicles, or help speed up cell renewal. For these additional therapies it is of course important to be able to visit the centre regularly during the course. If you don’t live in London but are able to visit either of Belgravia’s Central London hair loss centres at least for your initial examination and consultation, you will normally be able to take any recommended products with you to use at home. In this case you will receive full instructions on how to use the products and how to re-order. If you are based abroad or outside London and are unable to visit either of our clinics, you can complete our online consultation instead, which allows you to upload photos.